Selecting Investment New Loan from the Investment Analysis dialog box’s menu bar opens the Loan dialog box displayed in Figure 56.22. Name holds the name you assign to the loan. You can set the name here or within the Portfolio area of the Investment Analysis dialog box. This must be a valid SAS name. The Loan Specification area gives access to the values that define the loan. Loan Amount holds the borrowed amount. Periodic Payment holds the value of the periodic payments. Number of Payments holds the number of payments in loan terms. Payment Interval holds the frequency of the Periodic Payment. Compounding Interval holds the compounding frequency. Initial Rate holds the interest rate (a nominal percentage between 0 and 120) you pay on the loan. Start Date holds the SAS date when the loan is initialized. The first payment is due one Payment Interval after this time. 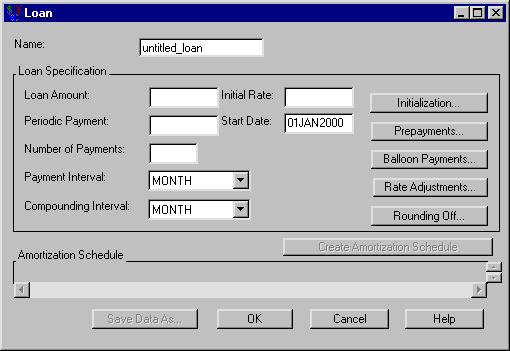 Initialization opens the Loan Initialization Options dialog box where you can define initialization costs and down-payments relevant to the loan. Prepayments opens the Loan Prepayments dialog box where you can specify the SAS dates and amounts of any prepayments. Balloon Payments opens the Balloon Payments dialog box where you can specify the SAS dates and amounts of any balloon payments. Rate Adjustments opens the Rate Adjustment Terms dialog box where you can specify terms for a variable-rate loan. Rounding Off opens the Rounding Off dialog box where you can select the number of decimal places for calculations. Create Amortization Schedule becomes available when you adequately define the loan within the Loan Specification area. Clicking it generates the amortization schedule. Date is a SAS date, either the loan’s start-date or a payment-date. Beginning Principal Amount is the balance at that date. Periodic Payment Amount is the expected payment at that date. Interest Payment is zero for the loan’s start-date; otherwise it holds the interest since the previous date. Principal Repayment is the amount of the payment that went toward the principal. Ending Principal is the balance at the end of the payment interval. Print becomes available when you generate the amortization schedule. Clicking it sends the contents of the amortization schedule to the SAS session print device. Save Data As becomes available when you generate the amortization schedule. Clicking it opens the Save Output Dataset dialog box where you can save the amortization table (or portions thereof) as a SAS Dataset. OK returns you to the Investment Analysis dialog box. If this is a new loan specification, clicking OK appends the current loan specification to the portfolio. If this is an existing loan specification, clicking OK returns the altered loan specification to the portfolio. Cancel returns you to the Investment Analysis dialog box. If this is a new loan specification, clicking Cancel discards the current loan specification. If this is an existing loan specification, clicking Cancel discards the current changes.